Colorize your watch! Fintie protective bumper case for 38mm Apple Watch. Includes 3 easily interchangeable colors (2 pieces for each color) to protect your watch from scratches and maintain that shiny bright appearance. Designed for 38mm Apple Watch Series 3 (2017) / Series 2 / Series 1 / Original (2015) Nike+ Sport Edition All Models, Not for 42mm Apple Watch. Case Only, Apple Watch, watch band or screen protector are not included! Specifically designed for All Versions 38mm Apple Watch Series 3 (2017) / Series 2 / 1 / Original (2015). NOT FIT for 42mm Apple Watch. 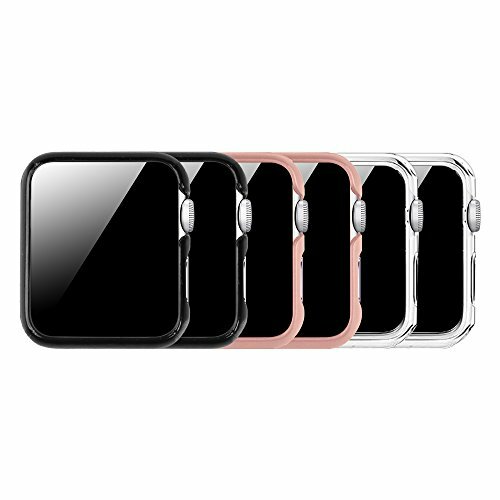 Premium Polycarbonate Hard Protective Bumper Case Cover for your Apple Watch. Slim and lightweight design. Access to all controls, buttons, sensors and Apple watch features. Including 6 pieces of Apple Watch case. 3 different color combination pack dresses your Apple Watch to match your daily mood. Easily to install. Cases Only, Apple Watch and Watch Band are not included!